Stratford is no doubt the coolest up and coming area in London. Since hosting the Olympic Games in 2012 the area has seen so much regeneration and change. It’s vibrant, it’s creative and it’s full of great food and shopping. Get yourself hyped for another day in the big city at The Breakfast Club in Hackney Wick. This eclectic caf (not to be mistaken for cafe, they insist, because they do ‘a mean old all day food and drink offering’) by the canal has been owning breakfast in the area since 2016. You’ll know when you’re there because you can’t miss their sunny yellow front and comical giant runny egg! 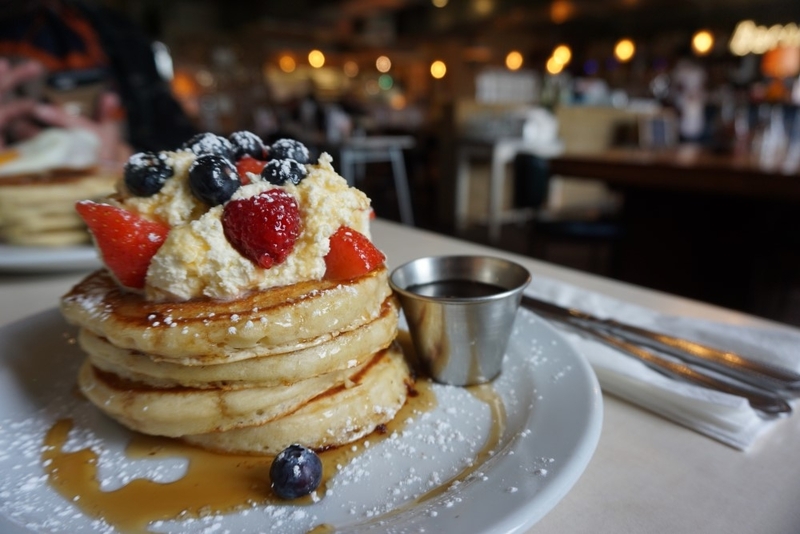 You’ve got to try their pancakes and berries – a skyscraper of delicious, super fluffy pancakes topped off with extra sweet vanilla cream and fresh berries. Best enjoyed doused in maple syrup. Instagram likes guaranteed. Go on, if you can’t indulge on a city break, when can you? We’re obsessed with the atmosphere in this place, you walk in and instantly feel part of the furniture, thanks to the insanely lovely staff and homely touches (hello seventies wallpaper!). And speaking of wallpaper, the decor gives us serious jumble shop vibes, with quirky signs, plastic junk, retro posters, taxidermy and embroidery hoops all about. We hear they’re huge supporters of the local community too – kudos guys! 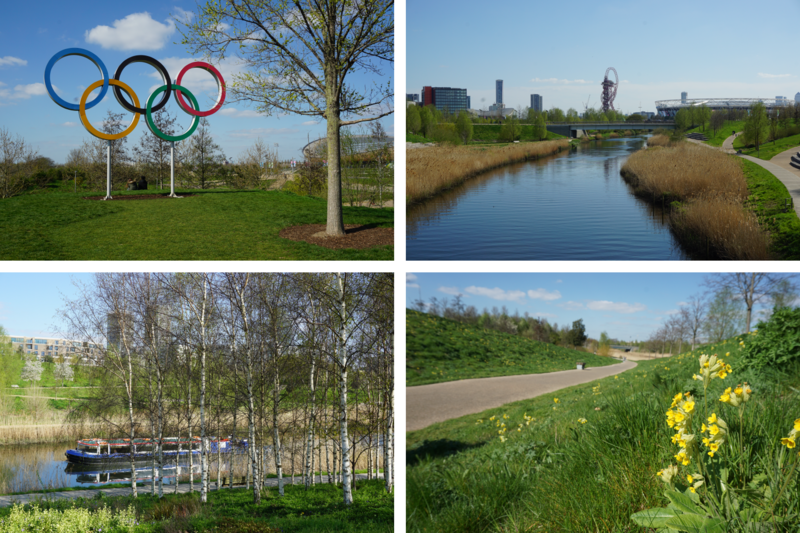 That big breakfast is going to come in handy as you set out to explore the 560 acre Queen Elizabeth Olympic Park. And there’s no better place to start than the iconic Olympic rings! Grab a selfie with the sculpture and then take in the views from the hilltop – from here you can see the velodrome, along the River Lea, and the Arcelormittal Orbit in the distance. You’d hardly know you’re in the Big Smoke while you’re wandering about amongst the sweeping green landscape with its slopes, dips and many levels. You’ll pass through meadows full of native flowers like cowslips, over bridges, through wetlands, along grassy riverbanks and into breathtaking gardens. It’s the place to be on a sunny day! If you’re feeling more adventurous then you could hire a bike to see every last inch of the park, which is the UK’s largest new urban park in over 100 years. During the summer months hop on a boat tour or have a ball powering around the waterways in a swan pedalo. You can also get your fill of contemporary art in the park, download the trail, here, to check out colourful wall murals and perspective shifting sculptures. Make your way to Crate Brewery and Pizzeria along the canal towpath. 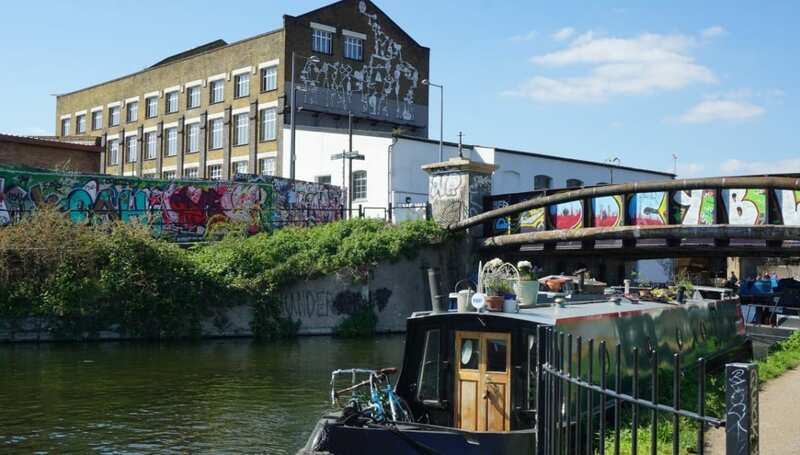 The locals have nicknamed this area ‘the Hackney Riviera’ and you’ll see why as you pass cute barges moored up, riverside bars and graphic walls with graffiti sprawled across them. 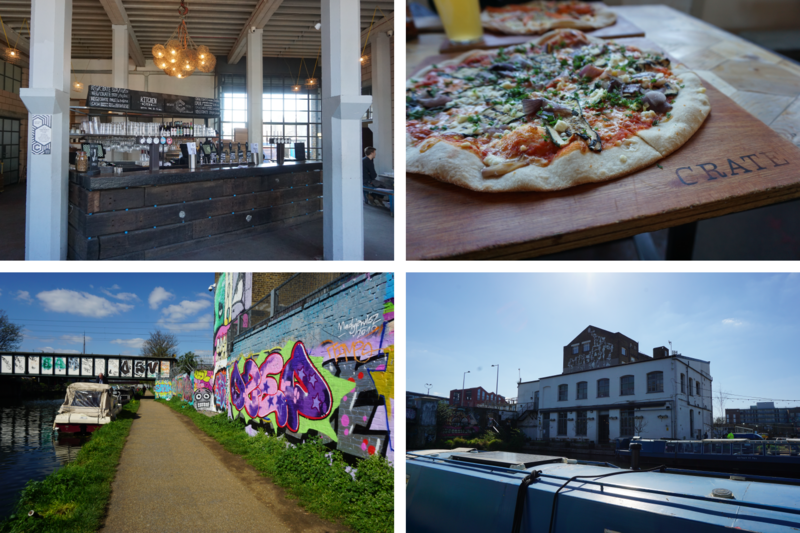 Housed inside a local landmark, The White Building, it’s no secret that Crate do the best pizza in Hackney Wick. The building started life as a sweet factory and its industrial past has been kept alive in its current form with breezeblock walls still exposed, a bar made from railway sleepers, light fittings made from bed springs and metal tables and benches finished with reclaimed wood. Crate’s pizzas are insanely good. They’re made from scratch in house by a very vocal Italian chef (he’s a talented guy, he deserves to shout about it), with locally sourced ingredients. The courgette, feta, red onion and gremolata pizza gets 10/10 from us! Be sure to wash yours down with a Crate beer, created in the brewhouse next door, which you can see into from the bar. Or if you’re as impressed as we were with the selection of guest beers, why not get yourself a sharing bottle – a rare treat! It’d be a crime to come to East London without hitting up Old Spitalfields Market, especially if you’re a bit of a shopaholic. Hop on the Overground at Hackney Wick and change at Highbury and Islington for Shoreditch High Street. You won’t believe how ridiculously big the market is as you set foot through the undulating metal gates, and under the cover of the sky high glass roof. The little plywood stalls are jam-packed with one off and handmade items by independent makers. Jewellery, art, leather bags, vintage hats, innovative fashion labels, unique homeware, cute clothing for kids…you name it, they’ve got it. 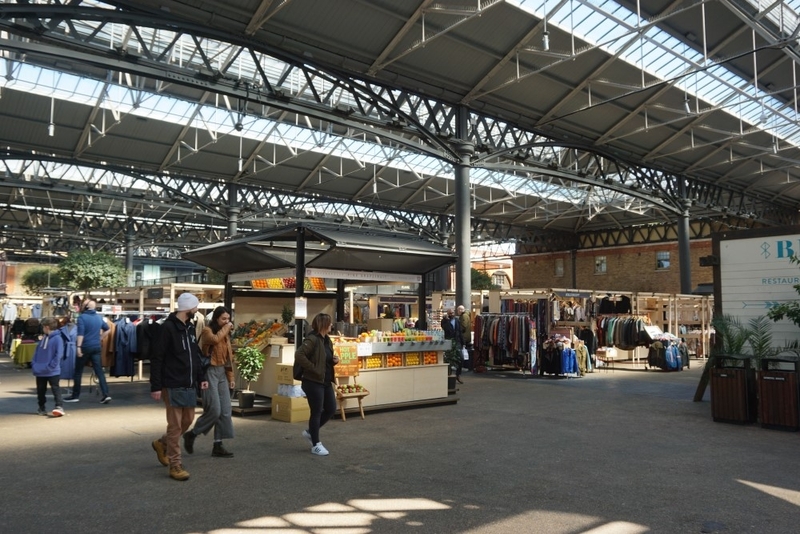 Around the outside of the market you’ll find well known high end shops and chains, alongside awesome independents like Inspitalfields maximalist gift shop and lifestyle boutique Source too. You might have just had lunch but it’ll be hard to resist treating yourself to a little extra something from one of the street food stalls in the middle of the market – you can pretty much smell something delicious wherever you go. We could bang on about Old Spitalfields Market all day but seriously, go see it for yourself. Ps. There’s a top-notch antique market every Thursday. Chances are your full on day has caught up with you by this point so why not whip something up for dinner back at your apartment and take it easy for a while? You’ve got a fully-equipped kitchen in there after all! You could pick up ingredients at the market, there’s a great little greengrocers called Pink Grapefruit, or in a nearby supermarket. Or there’s always Deliveroo, Deliveroo is always a good idea. Stratford East is a jewel in London Stratford’s crown and not to be missed! This award winning theatre has come a long way from the melodramas which it originally specialised in. These days this is the place to catch new works, touring shows and top quality tribute acts. In fact many of their productions end up transferring to the West End – always a good sign! 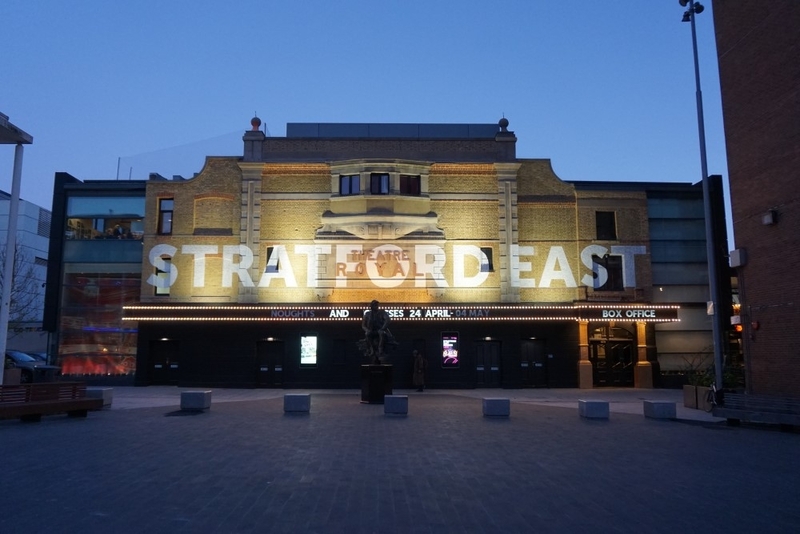 Community is at the heart of everything they do at Stratford East, with regular inclusive showings (BSL, audio described, captioned and relaxed showings) and performances involving local choirs and community groups. The theatre’s history is almost as dramatic as the plays that have graced the stage here over the years. Stratford’s first permanent playhouse was met with objections when it opened in 1884 and in the early years the theatre struggled for money. The building also narrowly avoided demolition in the late 1960s by becoming Grade II listed. And because of this the inside of the building still has that old time charm, with its original elaborate decoration intact. Check out what’s on, here. 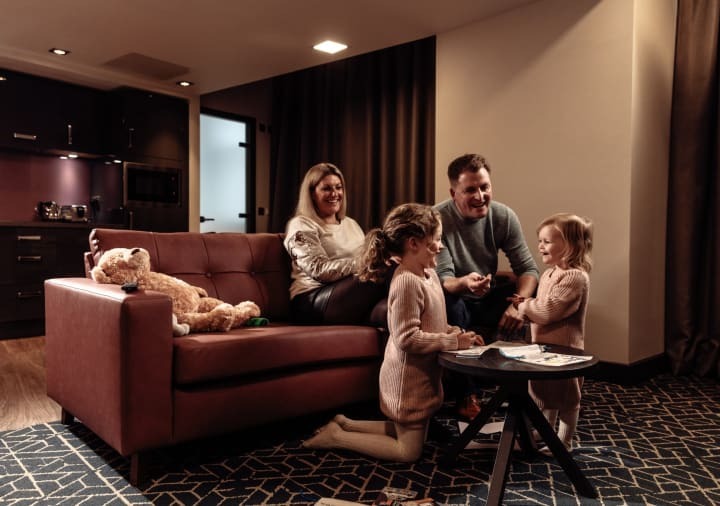 Now you’re in on all the places to be and things to see in the area, check availability at Roomzzz London Stratford, here.